Welcome to this exclusive edition of ShoutMeLoud where you will be learning how to create and setup your WordPress blog. 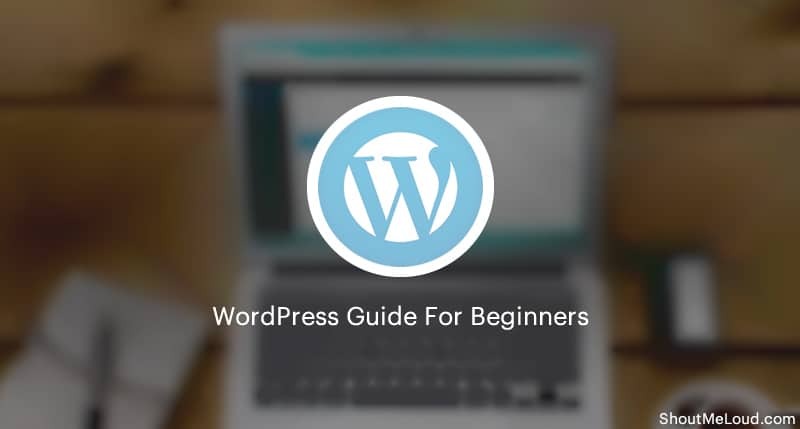 This guide is exclusively for new bloggers who want to set up their blog on the WordPress platform. For existing WordPress bloggers, I have also listed some pro tips that you should start implementing right now to make your WordPress blog more professional. How to buy web-hosting and a domain name for your WordPress blog. Essential things to setup after installing WordPress. Things that you need to do immediately after the initial WordPress configuration (Step by step tutorials with pictures). WordPress plugins that you need to install and how to set them up. Pro tips to make your WordPress blog grow faster. Essential SEO of your WordPress blog. You can have your WordPress blog up and running in the next 10 minutes. Do remember, this WordPress for beginner’s guide is crafted with the utmost care and is regularly updated. You should bookmark this page for future reference. You are encouraged to browse our WordPress catalog where you can find more articles apart from what I have listed here. The first thing that you need to do in order to create a WordPress blog is to buy web-hosting and a domain name. Web-hosting is where your files are stored. The domain is the name of your blog. You can buy hosting from Bluehost, which comes with a free domain and costs only $5.95/month for unlimited hosting space and bandwidth (with the discount link below). This process will take 5 minutes and here is a guide to help you along the way. Click on the below link and get a hosting package now. Good job on getting this far! Your blog is now up and running. But before you play with more stuff, let’s quickly watch a few videos that will make you understand WordPress better. If you need more systematic video training, get it from here. Here are a few more things that you need to learn before moving to the next level. This will help you to move through everything quicker and without getting stuck anywhere in between. With all of the above steps completed, you have graduated from newbie to beginner! One of the major mistakes that many newbies make after creating a WordPress blog is they don’t bother setting up some of the things that can create a huge difference. These few setups will help out in every aspect of your new website and each step won’t take more than 5 minutes. In case you have any confusion, you can drop me an email at [email protected], and I will reply to your query within 24 hours. These steps are going to create the biggest difference for your WordPress blog. This section will ensure you start driving traffic to your blog & your written post will be seen by more people. You will need about one hour to understand everything here. If you have been learning and implementing everything continuously thus far, take a break! Come back with a fresh mind as you will be learning the things that will make you stand apart from other bloggers. This plugin will find all broken links (internally and externally) and quickly fix them. Do let us know if you want to add any specific WordPress topics into this WordPress guide. Don’t forget to subscribe to our email newsletter for more helpful tips, insights, and guides! Note: In the spirit of full disclosure, this is an affiliate link, which means that I may get a commission if you decide to purchase anything from any of the above-listed companies. I only recommend products & systems that I use and love myself, so I know you’ll be in good hands.